A major clinical setback removed a potential blockbuster drug from Alnylam's pipeline and led to a collapse in the company's share price. 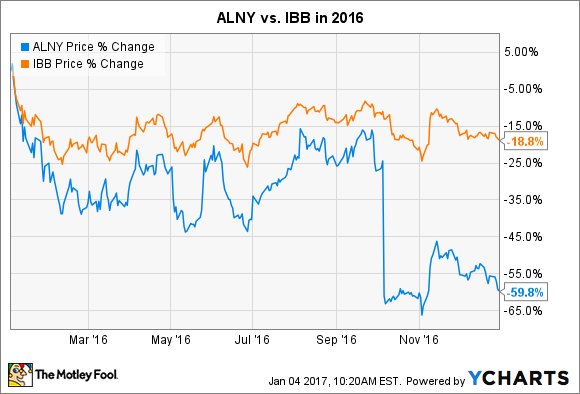 2016 was brutal for investors in Alnylam Pharmaceuticals (NASDAQ:ALNY). Shares of the RNAi-focused biotech utterly collapsed, falling by nearly 60% during the year, according to data from S&P Global Market Intelligence. That was a far worse decline than the 19% loss by the biotech sector, in general, as measured by the iShares Nasdaq Biotechnology ETF (NASDAQ:IBB). While Alnylam's share price was weak through the first nine months of the year, investors can mostly chalk that up to the general sell-off in biotech. However, the company's stock was decimated in October after the company reported a major clinical setback. On Oct. 5, management stated that the company was discontinuing development of revusiran, a compound that was aimed at treating hereditary ATTR amyloidosis with cardiomyopathy (hATTR-CM), a rare condition that can lead to heart failure. The decision was made in response to a recommendation made by an independent monitoring committee that was watching the drug's late-stage trials. The committee concluded that the potential benefits of using revusiran were not high enough to outweigh its risks after several patients involved in the trials had died or suffered nerve damage. Management agreed with that bleak assessment and abandoned all future development. Since revusiran was believed to hold blockbuster potential and was one of the company's most advanced compounds, the update didn't sit well with investors. Shares fell by more than 48% on the day of the announcement and have yet to recover. Management was quick to point out that its decision to stop development on revusiran would not impact any of their other RNAi drugs in development. Importantly, this includes patisiran, which is another compound that's being studied as a treatment for ATTR amyloidosis. Top-line data for patisiran's late-stage clinical trials is still expected to be available in the second half of 2017, which gives investors hope that Alnylam can still transform itself into a commercial enterprise as early as 2018. That being said, there's no doubt that revusiran's failure was a huge blow to shareholders. Not only did it remove a potential blockbuster drug from hitting the market, but it also raised serious safety questions about the rest of the company's pipeline that utilizes the company's gene silencing RNAi technology. If future studies also show that this drug-making technique is too unsafe for real-world uses, there could still be a lot more pain ahead for shareholders. Given that there are so many unknowns, I think the smart move for potential investors to make is to take a wait-and-see approach to this risky biotech.